Despite the President’s order (issued in April of 2011), the American public’s satisfaction with the services it receives from the federal government continues to decline, according to a 2015 report from the American Customer Satisfaction Index (ACSI) . The public’s satisfaction level dropped to 64.4 (on a scale of 100) in 2014, the lowest since 1999, when ASCI first began measuring the public’s satisfaction with the federal government. Compared to the overall satisfaction scores for more than 40 private sector industries, only internet service providers received a lower overall score. 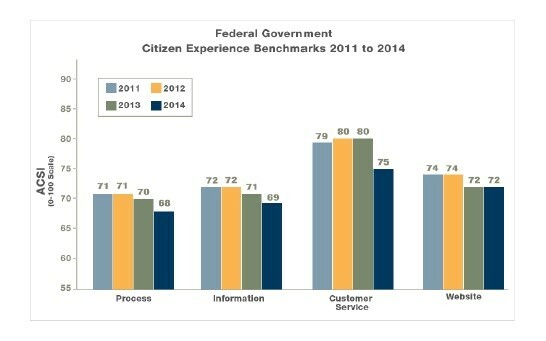 This isn’t to say that all government customer service is on the decline. 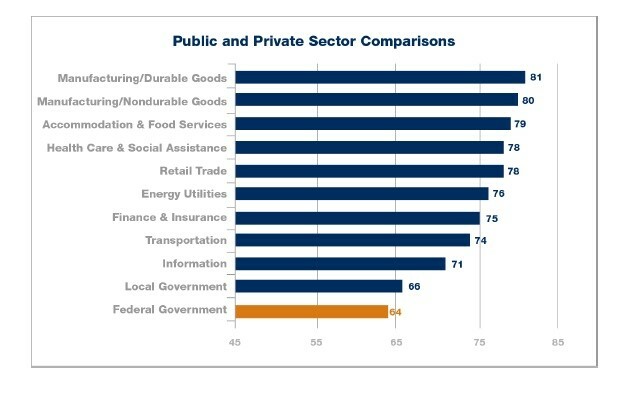 In the same ACSI report, in fact, there were a few individual agencies that ranked as well or better than the best of the private sector. In addition, success stories such as BusinessUSA (run by the Small Business Administration and Commerce Department) are demonstrating that it is possible for agencies to increase their service satisfaction numbers to levels comparable to customer-services leaders in industry. Perhaps the decline in government-customer satisfaction should not be surprising, given the budget constraints and staff cuts that many agencies have faced in recent years. As is the case in the private sector, one of the first impacts of cost-cutting is lower customer service. Since higher levels of customer service are found in labor intensive service delivery environments (in federal entities), that circumstance may point to one of the causes of erosion in service satisfaction levels. And, regulatory agencies faced with greater challenges with customer satisfaction, find it even more difficult to maintain higher levels of customer service with fewer employees available to deliver those services. The ASCI report revealed a lower year-over-year decline in “customer experience” than with “customer satisfaction,” although all of the other (key) scores that contributed to the “customer experience” rating remained lower than 75 ( the customer service rating). For instance, survey respondents rendered a lower score in 2014 (69) than in 2013 (71) for the clarity and accessibility of information that agencies provide to the public. Also, customer experiences with agency websites remained constant with a benchmark of 72. While Americans are less satisfied with most aspects of federal services they receive, the report does reflect that customer service ratings (specifically, courteousness and professionalism of agency staff) have declined the most. Indeed, customer service ratings dropped precipitously in just one year – from 80 (in 2013) to 75 in 2014. Millions of Americans depend on federal agencies for vital services, and delays in processing those requests often cause understandable frustration and hardship, and government customer service delivery breakdowns appear in the headlines very frequently. A number of other recent polls focusing on government customer service indicate that many Americans increasingly feel like second-class citizens these days. Despite encouraging efforts on the part of several agencies to raise the bar on customer service satisfaction, most federal government customers are not experiencing better service. This was confirmed by Forrester Research’s most recent U.S. government customer experience survey, which revealed that less than half of the respondents felt that their experiences made them feel like valued citizens. Less than half of them also indicated that their dealings with federal agencies made them feel proud of their country. Why do people perceive the government as a poor service provider? Why are the perceptions of government so negative? These are questions not easily answered, because the federal government represents one of the most complex human-driven ecospheres in the world, and its 2.7 million employees find themselves in such a constrained operating environment – i.e., subject to laws, regulations, policies, business rules, procedures, etc. -- that they don’t feel adequately empowered to meet the ever growing expectations of their customers. In an effort to assure fair and equal treatment of American citizens, and to combat corruption, a system of government evolved over time to distribute power (in the Executive Branch) across departments and agencies – and among their leaders. Checks and balances were created to remove discretion from the equation, so that government operates on the basis of fairly rigid policies and procedures. Though that has had the effect of increasing fairness -- those gains have been achieved at the expense of flexibility. The government employee encountered by a customer as s/he interacts with the federal government is required to conform to policy and procedures, which largely precludes the kind of discretionary power that many managers, supervisors, or key employees in the corporate world could be expected to exercise. Perhaps more than other forms, a democratic government aims for equal and fair treatment for all, and the very nature and structure of that government doesn't tolerate much variance for employee decision-making, as they struggle to meet or exceed their customers’ needs. Meanwhile, much uncertainty and confusion has emerged in many government service organizations, around critical factors such as eligibility criteria, entitlement levels, and decision rights – which has had the encumbering effect of causing many employees to become ever more risk-averse over time –, which has led in turn, to a significant drag-effect on end-to-end service-delivery processes. This helps to explain why a government customer must often interact with several departments and multiple people to get anything done at all, thus leaving a sense that s/he is being passed from one person to another with no one assuming responsibility for resolving the real situation, or even assuring that that the customer’s inquiry or issue – not to mention account information or interaction history – is shared among the many contacted civil servants. Meanwhile, in today’s globally accessible and technologically advanced era, service excellence has grown to be as important to customers as the products and services they consume. Market leaders in many industries understand this, and have worked hard to develop and refine a customer service experience that is personalized, fast, easy, and readily accessible. Americans have also come to expect the same level of services from government that they experience in the private sector. 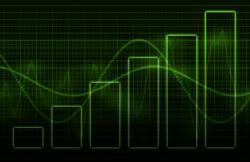 But how does the public sector measure up when it comes to service innovation? Though the general perception is negative, with government often perceived as being slow, bureaucratic, and rarely innovative. On closer examination, however, governments have made great strides in leveraging the Internet to make information more accessible to the public – but service transformation in the private sector has moved even beyond that. Slowly but surely some governments have come to recognize that service transformation, and particularly customer-centered service delivery, is what’s needed to achieve desired public service outcomes. By putting the customer at the center of service delivery, programs and services can be organized around client needs, and more closely aligned with expectations. To inform my own efforts to help senior government leaders transform their agencies during the past twenty years, I have made it a point to learn as much as possible about best practices in the private sector – with a view toward adapting those best practices to the operations of entities in the public sector. 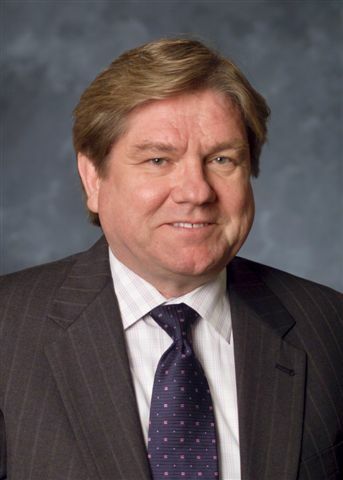 As recently as July of this year I had an opportunity to spend one day meeting with senior leaders at Procter and Gamble (P&G) in Cincinnati and another day with leaders of the Cleveland Clinic – two very different enterprises that have earned stellar reputations for, among other things, providing excellent customer service. What I learned during those two trips reinforced what I have learned at many other high performance organizations over time. To someone outside of P&G, “The Consumer is Boss!” might sound like a whimsical slogan. Yet, these four simple words appear to be the driving force behind a company of over 130,000 employees focused on transforming consumer wants and needs into brands that excite, delight, and deliver. They reflect a deliberate approach to innovation, which is focused on matching what’s needed with what’s possible. At the Cleveland Clinic, it quickly became clear that everyone believes they work for one of the most innovative, forward-looking medical institutions in the country. Just by talking with them, I learned that: group practices provide better care at lower costs to patients; collaborative medicine is more effective; big data can be leveraged to improve the quality (while lowering the costs) of care; cooperative practices can lead to greater innovation; empathy is the secret to achieving better patient outcomes; the provisioning of healthcare (not “sick-care”) leads to higher levels of patient satisfaction; healthcare is best provided in different settings (dependent on the comfort levels and preferences of patients); and that tailor-made care treats a person and not a disease. I also learned that delivering valued services entails something else as well: that the management of customers -- who are not just consumers of the services – can be integral to their delivery. And, because customers’ involvement can have enormous impacts on outcomes, service providers must develop creative ways to leverage their participation in transformational endeavors. Based on professional experiences such as these, and from related research around the globe, the following customer service strategies have been found to be successful in the private sector. To some extent or other, these four strategies should be adopted by government leaders, and adapted to their own operational environments, to achieve substantial improvements in customer satisfaction. Government customers want to be better understood, and they want agencies to be responsive to their input. Agencies can also gain a lot by listening to their customers, because they can enhance the customer experience only if they understand where improvements are needed. One way to capture customer feedback is to do conduct surveys on a periodic basis, and many agencies are doing that already. This method can be helpful when contemplating proposed changes to services or for conducting wide-ranging assessments of agency performance. The drawback, however, is that such surveys are often conducted on an annual basis, which means that agencies discover issues only after they’ve emerged as a drag on the customer service experience. Survey questions also tend to be quite general – and not focused on specific risks or challenges. For these reasons, it is essential that customer inputs be captured when and where the “pain – or pleasure – is felt.” One way to accomplish this is by eliciting (both quantitative and qualitative) feedback as each customer interaction with the agency is completed. Data collected in short, simple questionnaires, when properly analyzed, can enable agencies to know a lot about how their customers feel about the encounters they’ve had with staff members, or via electronic transactions. The agency can then react to any glitch, hindrance, or quandary that may have emerged, and immediately “repair” any given customer’s experience while also gaining important insight into lurking gaps and weaknesses its operational processes. Agencies should also let customers know that they are “hearing” and constructively reacting to their feedback – via both individual notifications and targeted communications (letting all customers who have complained about a given issue know that it has been – or is being – resolved in a timely manner with the help of the information customers provided about it. An agency’s employees, at all levels, need to be empowered to take greater responsibility for dealing with operational situations they encounter on-the-job, such that less-experienced staff members can provide some level of assistance to customers who contact the agency at times when more experienced subject matter experts may not be available to respond. To make this work, more customer-facing employees need regular (authorized, of course) access to a broader range of institutional knowledge than what might be currently associated with their assigned roles and responsibilities. This should include greater subject matter knowledge, so that employees in one business unit can access an appropriate but meaningful level of information for the same customer, about potentially available benefits or services, no matter where it resides in the enterprise. This will help to ensure that customers receive consistent, accurate, and current information that responds to their needs, regardless of how they contact the agency. Customer-facing employees should also possess adequate knowledge of the customers they’re assisting, which can include information such as the benefits the customer is currently receiving or the status of an open application. Though this data may be contained in one or more “other systems or data repositories,” it needs to be instantly integrated into whatever screen employees normally view as they help customers. With this unified view of the customer’s history and status, including interaction context, more employees can help customers more effectively and quickly. This outcome is achieved when customer-facing employees can view past interactions with a given customer. If a customer has already talked with another agency employee about today’s topic, that fact will become apparent from scanning the information presented onscreen, thus enabling today’s employee to avoid repeating questions that had been previously answered. This shortens the length of calls, while minimizing the chance of frustration on the part of today’s customer. It’s also important to empower customer-facing employees to create and modify knowledge. They are often the first to discover issues and situations that need to be incorporated into the knowledge foundation. By empowering these employees to initiate knowledge, agencies can help ensure that their knowledge foundation stays complete, up to date, and closely aligned with customers’ actual needs. One of the most frustrating customer experiences is dealing with one part of an agency that doesn’t know what another part of the agency is doing (or has done) to resolve an issue for a customer. This can happen when the department that qualifies individuals for a benefit has inadequate collaboration and communication with the department that subsequently manages the delivery of that benefit—or when the personnel responsible for processing a customer’s application are unable to adequately answer questions about needed prerequisite information (e.g., evidence to support a claim of eligibility). Customers don’t think in terms of having to touch multiple, different departments or offices within a Government entity. To them, the agency is the agency – and they have a reasonable expectation of finding continuity of information-sharing across that enterprise. To satisfy such (reasonable) expectations, agencies must transcend internal boundaries with seamlessly integrated data (virtual or not) that produces aggregated information that meaningfully addresses a customer’s inquiry or concern. Such experiences do more than just ensure that the customer is effectively served at every point of entry. They also preclude productivity-draining inefficiencies across the institution. In any agency, the customer record should be the primary means for capturing and tracking the status of a customer’s interactions with that institution. The record should provide a common source of information about a customer, his or her case, and its status over the course of time. The customer record can be retrieved and reviewed to understand what benefits and/or services have been requested, whether eligibility requirements have been met, what services have been delivered in the past, and what claimed benefits or services remain unresolved. As indicated in Strategy 2 above, employees must be empowered to make appropriate changes to the customer record -- and a single (authoritative) record must be used across all parts of the agency, pulling in necessary information and data from other sources as needed. Workflow automation is also essential in ensuring seamless handoffs among an agency’s business domains -- and its service support organizations. For example, personnel in other business domains can be automatically alerted when additional evidence has been collected by one business unit, e.g., evidence that supports a given customer’s outstanding claim for a benefit or service. This allows other units to decide whether next steps are to be taken by them, to move that customer’s case closer to final resolution. The effect is to eliminate any unnecessary delays (or “dead spots”) in that customer’s end-to-end service delivery process. Automated self-service represents another effective way to assure seamless customer experiences with a government agency. Self-service capabilities should deliver a seamless view of the agency to the customer, by providing a common resource for accessing and reviewing information across all functional areas. Agencies can further enrich the online experience by providing customers with a secure, individualized self-service zone that enables them to track personalized information about their interactions with that agency (such as requested forms or documents, the current status of claim(s), and projected completion dates) – all in one online location. As agencies struggle to streamline operational processes, they must also do a better job of ensuring that their resource investments (in people, processes, technologies, and facilities) are strictly governed and managed to ensure that every individual investment demonstrably contributes to the goal of improving customer satisfaction – which provides a great segue into the fourth customer experience improvement strategy. Achieving unrivaled customer experience levels is not just a matter of getting better service delivery methods in place. Agencies must also continuously measure and improve the effectiveness and efficiency of those mechanisms. This means that agencies have to establish specific objectives for process improvement, and reliable ways and means of measuring the quality of their customers’ experiences. Though there are many ways to measure customer experience, one is to use accepted quantitative metrics, like first-contact resolution (FCR) rates, average call times, average time to resolve a query, and transfer (or escalation) rates. Another way to measure customer experience is by soliciting subjective evaluations from customers, as described in Strategy 1 above. Evaluation results should also be analyzed to distill meaningful metrics that can be delivered to customer service providers via scorecards, dashboards, heat maps, etc. – that way ensuring constant transparency into changing customer satisfaction levels over time. Clearly communicate performance measures (and the goals/objectives they align with) -- To engage stakeholders in the endeavor to achieve established performance objectives, they need to understand (and buy into) what those goals are -- and how they will be measured for performance management purposes. Metrics and KPIs should also be clearly understood and accepted as part of an enterprise performance management program. Make performance results visible and transparent – Ever-present and highly visible dashboards and scorecards will help all employees track their own progress toward agency goals by creating an immediate feedback loop that will positively influence behaviors (leading to better performance results). Incentivize performance excellence – Though agencies may face constraints when it comes to granting bonuses or financial incentives to top performing individuals and groups, they can certainly recognize and reward it (while trumpeting rewards across the enterprise). Friendly contests among multiple teams are another effective way to motivate employees to do their very best to achieve performance goals and objectives. Periodically refresh performance goals and objectives (to “raise the bar” over time) – Goals should be continuously reviewed and adjusted as established performance levels become more easily reached and customer expectations continue to rise. Improved performance levels in other government agencies may also help to drive decisions in your agency to keep up with (or remain ahead of) the pack, so to speak -- as widespread adoption of industry and government best practices causes more and more stakeholders to realize that even greater customer satisfaction levels are indeed attainable. Most agencies, whether great or small, need to stop the decline in their customer approval ratings. Indeed, all agencies – as publicly funded operations -- need to do more than that to offer the best services available to customers anywhere, in the public or private sector. People are ready for more customer-centric government service, and higher quality services. Rising to the top with government customers is not an impossible mission. Several agencies (like the Social Security Administration, for example) have placed a strong emphasis in recent years on improving online information access and delivery, as well as the online customer experience, with mobile-responsive portals that provide answers to frequently-asked questions, 24x7. These same agencies have begun to empower more customer service employees by providing them greater access to business- and customer-related information. That access soon leads to higher customer satisfaction – not just with first contact resolutions, but also to more consistent service delivery across multiple access channels. Knowledge repositories are being used to provide more self-service to the public via trained staff, now equipped with the information they need to better serve government customers. Just like private sector customer service leaders (e.g., Amazon.com and Virgin Atlantic), a number of agencies have begun to collect customer feedback -- both directly (via survey tools) and indirectly (via social media), with the aim of using that greater insight to drive near-real-time improvements in customer service. At the same time, Congress and the Obama administration have been steadily pressuring federal leaders to become ever more accountable for agency performance results. Although “it's tough to make predictions, especially about the future,” as the late Yogi Berra so often reminded us, opportunities abound for government leaders – indeed, all public servants – to do the right thing by their customers going forward. The American Customer Satisfaction Index (ACSI) is the only national cross-industry measure of customer satisfaction in the United States. Mr. Mullins glosses over the fact that not every interaction between the government and a citizen is a "customer service" encounter. If I'm receiving medical services or employment assistance or financial support from the government, then I am the customer. If the IRS is calculating my tax liability or the county assessor is determining my tax liability, then I am NOT the customer. If the County is after me to pay my obligation from a civil judgment, I am NOT the customer. If the Procurement department is vetting my qualifications as a potential vendor, that is a regulatory function, not a service delivery function. For the IRS, I'm a supplier, and a mandated one at that! The customer of the IRS is the federal government eager for the cash it needs to operate. Being a supplier does not mean I can be treated disrespectfully, but the obligation to a mandated supplier is different than the obligation to a process customer. As a mandated supplier I deserve treatment that is (1) lawful, (2) transparent, (3) equitable, (4), respectful, and (5) timely. But the IRS is not bending over backwards to please and delight me. Nor should they. Customer service will always have a unique twist in the public sector. More often than not, the "customer" is not paying the bill. The bill is being paid by other stakeholders who are not interested in being at all lavish to secure greater customer satisfaction. The government safety net has limited resources, and it is targeted to prevent social disintegration, not to make everyone of its customers happy campers. In the private sector the customer's voice is king precisely because it is expressed through their purchasing dollars. I have many options if I'm shopping for consumer goods; I may have almost no options if I'm hoping for free medical care. Obama and Mr. Mullins are both off-base in thinking public sector should emulate private the sector. What we need to do sort out the process improvement methods that will for a combination of service and regulatory work. We need a process improvement methodology that doesn't assume great levels of flexibility since regulation seems to be on the upswing. And most important, we need stakeholders (citizenry, politicians, unions, community advocacy groups, State and Federal regulatory agencies, etc.) to realize that they need to collaborate in providing criteria for process quality that are consistent and viable. What government is usually facing is a cumbersome, inconsistent, and paranoid set of requirements. It's no wonder staff worry more about stakeholder satisfaction than about customer satisfaction. As the public, we're getting the exact government we demand. So we can't complain too much when that government can't deliver the services we might want when we're the customer.